Yes, we women rock! I am an old movie buff. I have always loved films. I grew up the road from Hollywood. Last year two films which were true stories uplifted all of us and showed how we women ROCK or ROCKED our world in a big way, and finally acknowledged women who had done great work. The two women empowerment films I am writing about are: Hidden Figures and The Eagle Huntress. 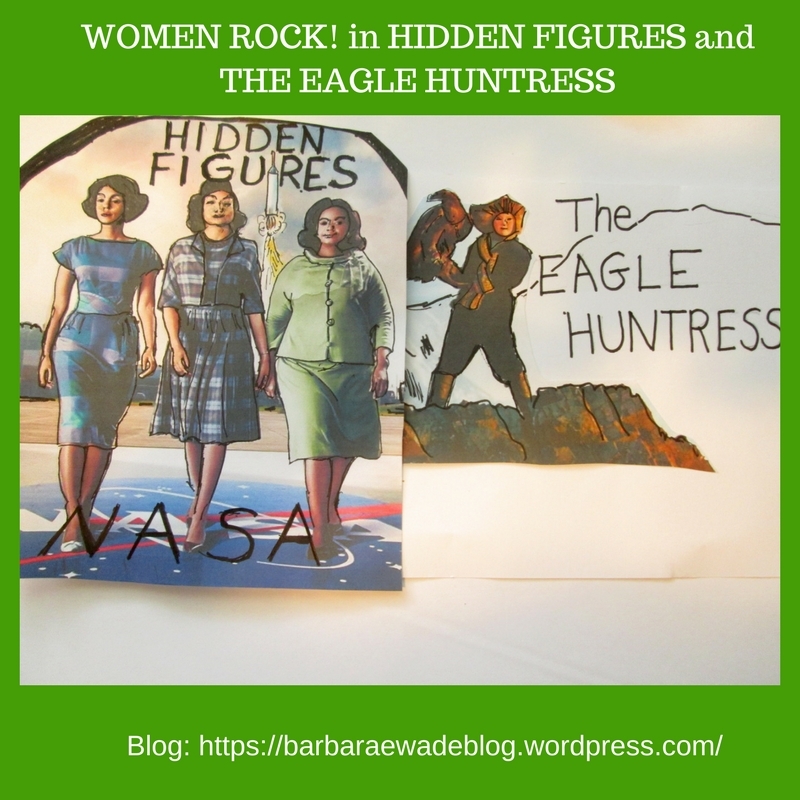 First, Hidden Figures (the actual story) took place when I was a child and then became a teenager when Katherine Goble Johnson (Taraji P. Henson), Dorothy Vaughn (Octavia Spencer), and Mary Jackson (Janelle Monae) were “computers” using their outstanding math and engineering skills at NASA to make the American space program possible. The fact they remained “hidden figures” until a few years ago, is stunning to me. Growing up I had NEVER heard about these women who were keys to the success of the space program. I was still fed the b.s. that women could not do math, even though my high school math teacher was a woman, and yes, I had my issues around math, until I had to teach it myself to adult GED students. When Dorothy Vaughn had to steal a Fortran book from the library to learn the computer language for IBM computers, I remembered stories that a Caucasian friend from South Carolina told me how he had to check out books for his black friend because there were two different libraries in the South. One for white folk, one for African Americans. Years ago, I also remember trying to learn Fortran myself, and not “getting it”. The fact that these three exceptional women are African American showed me their tenacity, as well as their intelligence. They were fabulous examples of women working together. They along with the other women who were “computers” and then became computer programmers showed me and ALL of us women how powerful we are when we WORK TOGETHER, cooperating- not competing. Also for the open-minded men who watch this film, men get to learn how truly amazing we women can be. That also showed up in the Women’s March last week, where many men were present along side us women. Not only did this film inspire me and others who see it, it has become part of one of the outings for young African American women to see in groups. The groups are from all over the country and are called Black Girls Code. The goal it to take at least 1,500 young black women to see Hidden Figures to inspire and encourage these young women to learn math. Fox Studios who distributes the film is helping to support this project. This story was also on npr. The film the Eagle Huntress was a beautiful film that showed how young adult women are powerful, too, particularly with supportive parents. This documentary showed the strength of a 13-year old bright girl called Aisholpan from Mongolia who had a dream to become an eagle huntress. In her culture only men had been allowed to become eagle hunters. She was able to show the nay-sayers how capable, courageous, and strong she is. At this film it was great to see young girls and women with their mothers and grandmothers at the small theater where this film was screened. The fact that both of these films were about women and our courage came out in 2016 is a great sign to me. Hollywood films are often escapism and massive budget films. 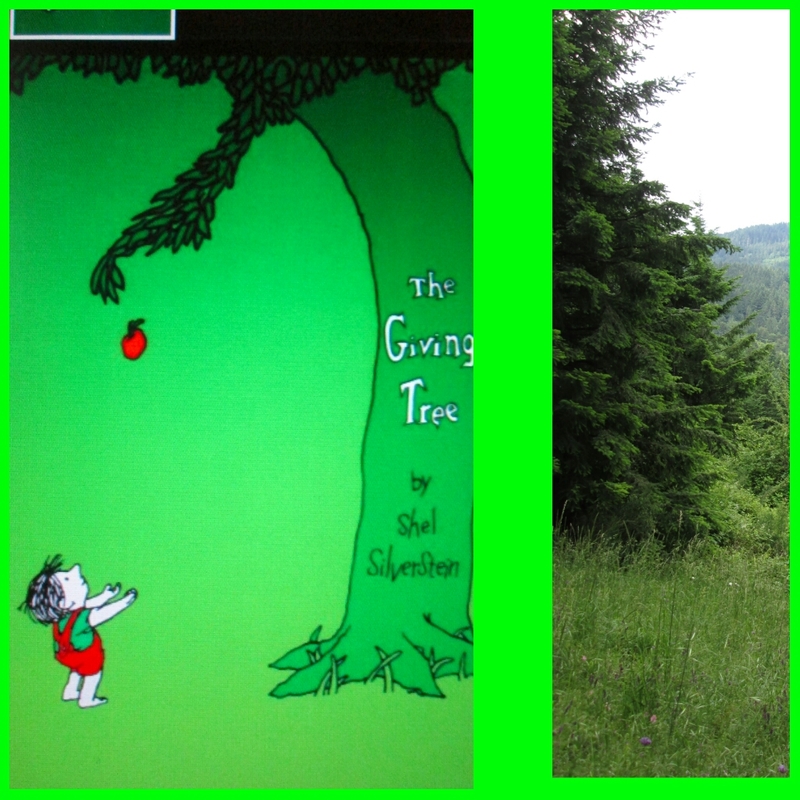 These two stories are relevant to ALL of us today. These are two films that remind all women and the men who love us that WOMEN ROCK and that ALL of us are needed to solve the problems that exist in our world today. Refugees are suffering around the world. Without taking sides about how this has happened and assigning blame, these refugees have real life threatening circumstances that we can only imagine. Often these refugees must escape where they have been living to stay alive. 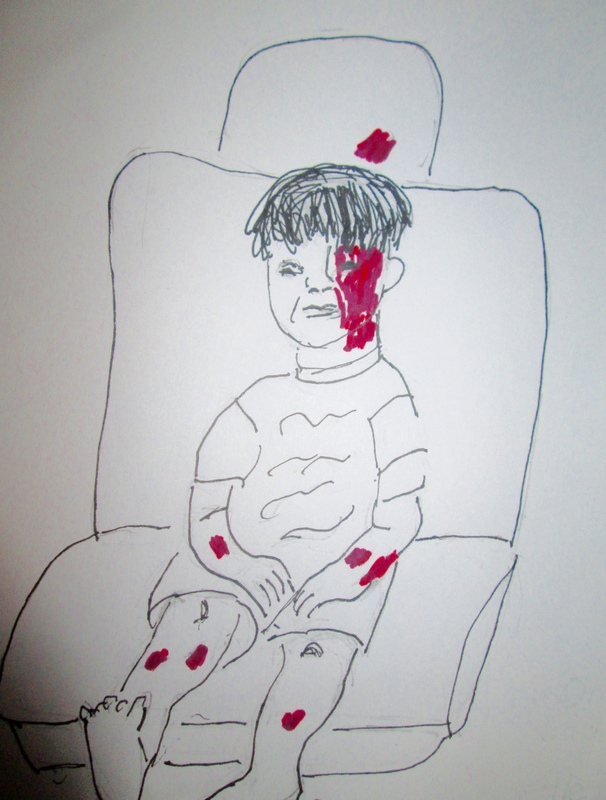 My crude sketch is of the five year old boy, Omran Daquneesh, who was playing with his brother who was 10 years old in the street. Omran was found under rubble after the bombing of Aleppo. He was photographed on August 20, 2016. His brother died. Omran is the face of many people who need to leave Aleppo, Syria, but can’t. He needs to be a refugee. When we do not allow but only a few Syrian refugees into the USA, we are blocking children such as Omran. This is the story from The Guardian. It includes a video of Omran. When those of us who want to ban refugees from our shores and particularly Syrian ones, they are often making their decisions based on worst case scenarios and fear towards these refugees. Fear towards those we do not know has never brought good solutions, particularly when that fear are not based on facts. During the Obama administration last year, 85,000 refugees have been resettled in the USA. About 11,000 of those refugees are Syrian. Here is a report that has good points to think about. A few weeks ago on Facebook, I was “liking” an Alicia Keys post about her Wearing No Makeup. Underneath that post, I saw another post and watched this remarkable 11 minute video. It captured the refugee experience with so much compassion and love. Not only are them some Americans, who are unwelcoming to the current refugees in this world, here are two stories, one about Calais, France which also includes England and the other is about Australia. To me the refugee “problem” is one because we humans make it one. It is hopeful that in the USA, it is often in the churches in various states that take up on the behalf of refugees. The church members in these churches live what they preach in action. In this case, the church and its members belong to the Nassau Presbyterian Church of Princeton, NJ. This was a story from September 14, 2016 on National Public Radio. It is not being “politically correct” to be kind to people who are in dire need as many refugees are. I am merely being humane. When I or we look away from what is happening in our world, I and we just become cold and heartless. I am NOT being the best I can be unless I care about others as I do myself. A Tribute to you, Muhammad Ali! I was never a great fan of boxing, but I grew up in a family with three brothers, so I watched boxing along with the rest of the family. When Muhammad Ali arrived on the scene when I was about thirteen, everything changed. His confidence was unreal. He REALLY did resurrect boxing. I loved his poetry, too. I could hardly wait for what he would say next. Integrity was one of Muhammad Ali’s greatest character assets. He absolutely stood up for what he believed in. Ali was very REAL, and after he lost his world championship title because he was a conscientious objector and would not fight in Viet Nam, I was awed by his courage. I have rarely ever seen an athlete or and other human being give up so much because of his or her integrity. As a younger person, I did not know what to think back then, but today I get how courageous and what a deep spirit he had and maintained throughout his life. Muhammad Ali’s deep character showed up in his fight for civil rights, too. He fearlessly spoke about race during some of the worst racial tension the USA had ever seen. He had suffered personally because of racism. He was not afraid to get all the political backlash that he received. However, because he stood up he became known as a world wide hero in Muslim countries and everywhere else. When Muhammad Ali revealed he had Parkinson’s Disease in 1984 when he was 42 years old, he grew again as a human being and accepted his illness with great dignity. Living with Parkinson’s Disease, for more than 30 years, again Muhammad Ali showed me what an amazing human being he was. I knew this disease because my father-in-law had had it, and Parkinson’s disease contributed to his last fall before my father-in-law died of complications 3 months later. Watching my father-in-law., Bill Briggs’ challenges, I had a small sense of what Ali was up against. Also seeing my aunt, Bunny Becker, with her challenges with Parkinson’s disease, I had an inkling what it took for Muhammad Ali to carry the torch for the 1996 Olympics in Atlanta. I was so proud watching him carry the torch and lighting the Olympic flame. For me that was one of the greatest positive moments of that Olympics. There was one other way that I have been inadvertently affected by Muhammad Ali. He touched the life of my nephew, Reza Izad, who was Muhammad Ali’s agent for a time. When I visit my sister’s home, I see the autographed photo from Mohammad Ali, and I know Ali made a difference in my nephew’s life, and I smile. NPR has done some great tributes to Muhammad Ali. Take a listen. These days too often we clamor to watch super heroes in films. For me, Muhammad Ali was a real live super hero. He has been present in my entire life. He has shown me how I can stand up of myself. He has shown me that you will not always be liked when you stand up for what is right. Also by example, I have seen how he grew and changed as he aged. Thank you for being such a positive force and example in my life, Muhammad Ali. I know that you have touched so many people on this planet, as you have touched me and my life. Rest in Peace, Muhammad Ali, you have helped to make this world a better place. I dedicate this blog to my brother-in-law, Captain Richard Henry Briggs, a marine pilot who died on June 5, 1974. I dedicate this blog to all soldiers, men and women who have put their lives on the line. Richard’s death taught me many things. He lived his life fully: laughing, pushing the limits, smiling, being kind, being a team player. He also taught me about peace. He only had 28 years on this earth, but he lived his time here to its fullest. He was known to most of us as Rick; his wife, Marv called him Richard. Rick was one of the soldiers who never killed anyone, or was even deployed to a foreign war. He was a pilot who trained on one of the most difficult planes to fly, the Harrier. He was the first Harrier pilot who died learning to fly it. Three more pilots died after Rick. The first generation Harrier was later no longer flown by the Marines. That plane had had many inadequacies. Rick paid the ultimate sacrifice during the middle of the Cold War. The photo of Rick is from the Naval Academy where he graduated in 1969. Memorial Day I went to a ceremony and celebration to honor Rick and all fallen soldiers. The photos in my featured image are from this Memorial Day. I felt deep compassion for families who have lost family members. A friend from North Carolina, Peggy Cardenas Heller, also knows of the sorrow of losing her husband, Captain Richard L. Cardenas, who flew a F-111 for the Air Force and died in New Mexico on October 3, 1977. He, too, was training as a pilot when he died. A monument in Clovis, New Mexico honors the 115 aircrew members (including Richard Cardenas) who had died in the F-111 from 1967- 1996. On the website for this monument stood the following poem. I try not to feel hopeless about what seems like our perpetual wars. I used to think that my brother-in-law, Rick, died in vain, but just yesterday I fully understood what a difference Rick made in my life. Now I stand up for soldiers and for 30 years have been an advocate for peace in a world where we still have a mindset that war is the answer. Today I was talking to my chiropractor while he was working on my back. I knew he was a former Marine. I told him the story about Rick, and he thanked me for sharing Rick’s story. In the late 1980s and 1990s, Dr. Matt (as we all call him) was in Europe working around the second generation Harrier as a Marine. The Harrier as it takes off is known for being one of the loudest sounds that exists. I found out today that Dr. Matt has a permanent injury from assisting with the Harrier during take off. We never know what our soldiers and former soldiers suffer, until we talk about them. What happens to our soldiers who have died and are still among us, I feel all must be honored. They do not instigate wars. Some of the homeless people on the streets where I live are Vets. Since the Department Veterans’ Affairs is falling down on the job, maybe it is up to the rest of us to care more in whatever way we can. Even if it just by giving those Vets a smile.